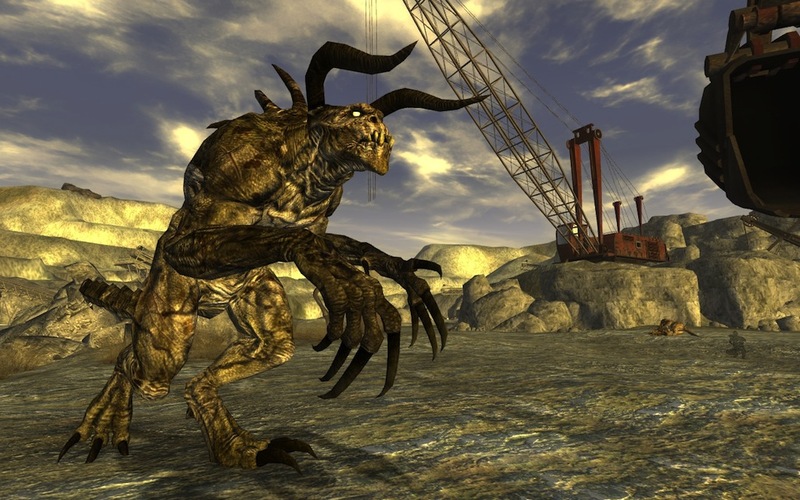 Duck and Cover - News: The Really Big New Vegas News Post. I warned that the closer we got, the more news would start flowing, so this is going to be a largeish news post covering a whole bunch of stuff at once. There will be pretty pretty pictures though. Over at the Bethesda Blog we've got a new Dev Diary talking about The Strip. Not too terribly exciting but hey, video! *There are 5 vaults in New Vegas. *They seem to be hinting Marcus won't be the only familiar face. *You can pickpocket c4 onto people and remotely detonate it at your leisure. *NCR has a working Monorail. *White Glove Bouncer beat you with canes.Really? *The NCR president's Vertibird is called Bear Force One. No, BAD game company.That is NOT clever. And There will be a live stream tonight of Josh Sawyer playing fallout new vegas and answering questions. 7pm Est. You'll be able to watch HERE. There, saved myself from doing a half dozen individual news posts. More when I find it.